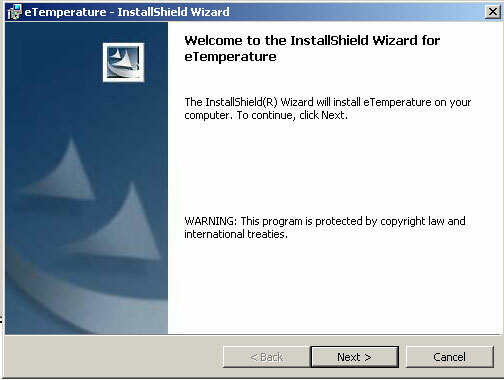 This guide will run you through the steps required to install and configure the eTemperature software on your computer. After that you can setup a logger, download results and then analyse the results. We have all of these guides available as downloadable PDFs. You must be logged in as administrator to install the software. Do NOT plug the USB reader in until AFTER installing the software. 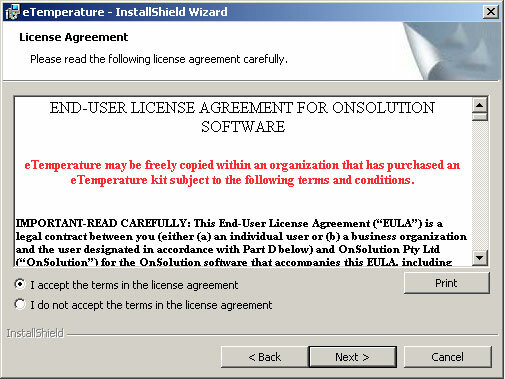 Select “I accept the terms in the license agreement” and press “Next”. Do NOT press “Finish” yet. 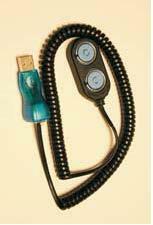 The reader is the cable that was supplied in the kit. It will typically have a USB connector at one end and either a double blue circle or a 45° angled connector at the other. The first time you plug in the reader you may be asked to do a hardware installation. Follow the prompts. Do not cancel out of the process. If in doubt, accept the default action. At one step you will be asked to proceed with an unsigned driver. Press “Yes” to continue with the installation. Press “Finish”. 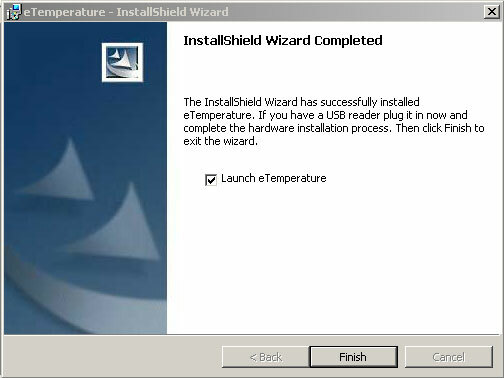 eTemperature will automatically start. In the future, run eTemperature by double clicking on its icon or by finding it within the Start Menu. You should see “Waiting” in the status area. If not, then configure the comm. port. 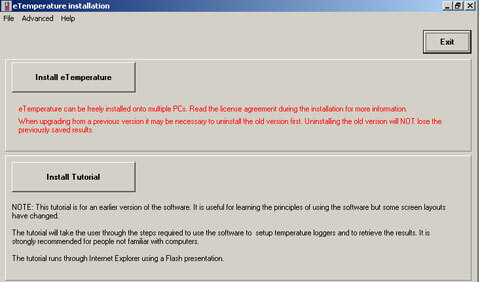 It is recommended that you run eTemperature once while still logged in as administrator. The following steps may not appear and can be disregarded. The unlock code can be found on a sticker on the USB connector where it plugs into the PC. 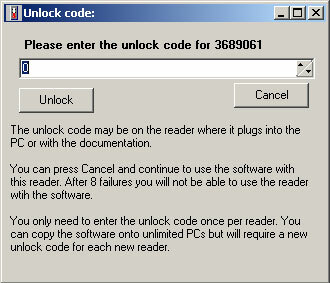 Enter the unlock code and press “Unlock”. You will not be asked to do this again. Fields in yellow are mandatory. 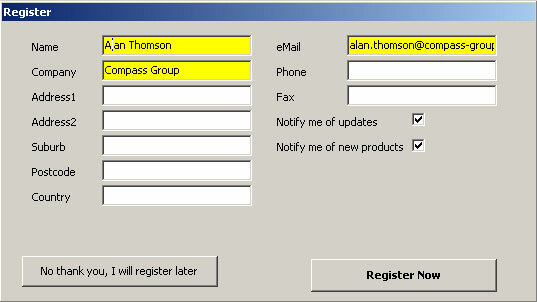 Complete at least these fields and press the “Register Now” button. 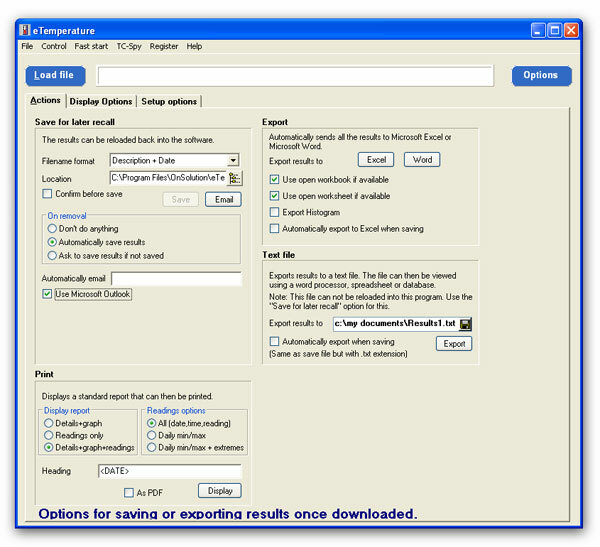 eTemperature will attempt to send an email from your computer. You may see a message notifying you of this. If so, allow the email to be sent. If the options tab is not immediately displayed click on the “Options” button. Press the “Options” button. 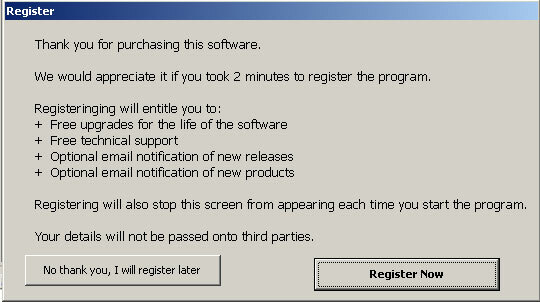 The following screen will appear. Select the “Actions” tab. Ensure the “Filename format” is “Description + Date”. It is recommended to set the “Location” to a backed up folder on a network drive. Ensure “On removal” is set to “Automatically save results”. You are now ready to setup a Thermocron temperature logger.